Certainly makes for an awkward situation. SMU linebacker Shaine Hailey picked off TCU quarterback Shane Robinson in the third quarter of Friday night’s game in Dallas. It was a huge play at the time, with SMU trailing 14-12. And the Mustangs showed off their Miami-esque turnover celebrating skills by breaking out a turnover crown and chalice (Miami of course goes with the turnover chain). 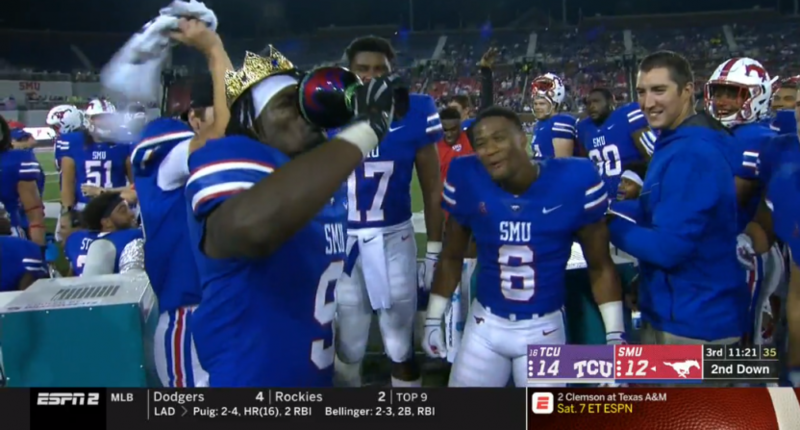 While the turnover crown and chalice fun was being had on the sideline, SMU quarterback Ben Hicks was sacked and fumbled. TCU’s Alec Dunham scooped the ball up and ran it back 25 yards for a Horned Frogs touchdown. 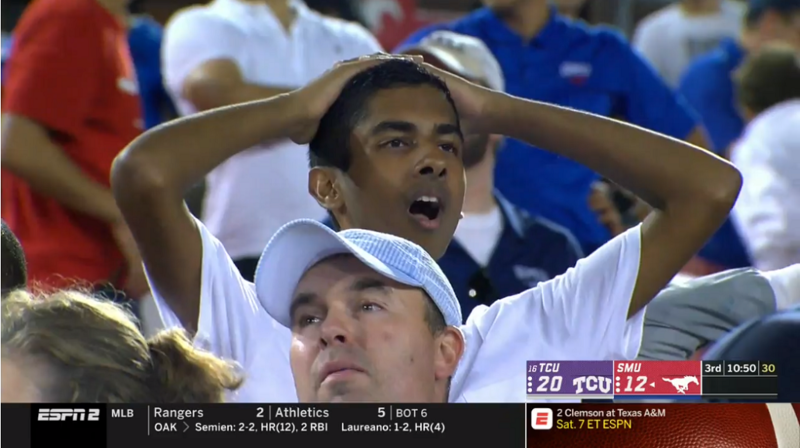 Welp, that’s an unfortunate turn of events, and all of a sudden Surrender Cobras could be found in the stands at Gerald J. Ford Stadium. TCU got off to a terrible start this game and trailed 9-0 into the second quarter, but has *really* turned it on since, with a 42-12 lead in the fourth quarter.